One Ticket to See Tracy Morgan at Ryman Auditorium on Friday, June 3, at 8 p.m. and a Limited-Edition Poster. Two Seating Levels Available. For $42, you get one Tier 1 level ticket and a limited-edition poster (an $84.50 total value). For $32, you get one Tier 2 level ticket and a limited-edition poster (a $64.50 total value). 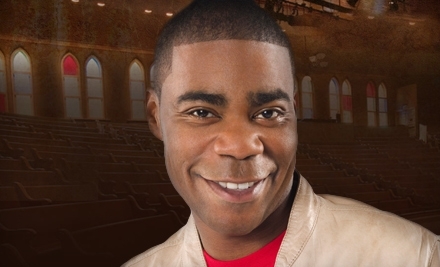 Blistering every seat in the house with his scorching wit, actor, comedian, and author Tracy Morgan brings his inimitable act to the historic Ryman Auditorium for a special night of raucous, adult-only hysterics. Beloved for his roles on Saturday Night Live, 30 Rock, and in numerous films, Morgan serves up an obstreperous stand-up act sure to tickle even the most irascible ribs until they weep with joy. Tier 1 tickets (a $69.50 value) allow audience members to ogle the funnyman from front main-floor seats, including the front sides, as well as the front section of the balcony. Tier 2 seating (a $49.50 value) is further back on the main floor and balcony and also includes front and back seats on the extreme sides of the balcony but still provides a good view of the on-stage action. Every ticket comes with a glossy, limited-edition poster (a $15 value) of Tracy Morgan, a souvenir with the potential to turn a house into a home and a home into a stop on local walking tours. Formerly the home of the Grand Ole Opry, the gorgeous, hallowed Ryman Auditoriumis as swollen with American history as George Washington's hand-crafted menagerie of balloon animals. If its walls could enunciate, they’d tell of visits from John Philip Sousa and Johnny Cash, or the accidental invention of bluegrass by James Brown and Katharine Hepburn. With fine, church-like seating, the heavenly confines of the Ryman help comedy consumers stay comfortable throughout their gleeful laugh attacks.